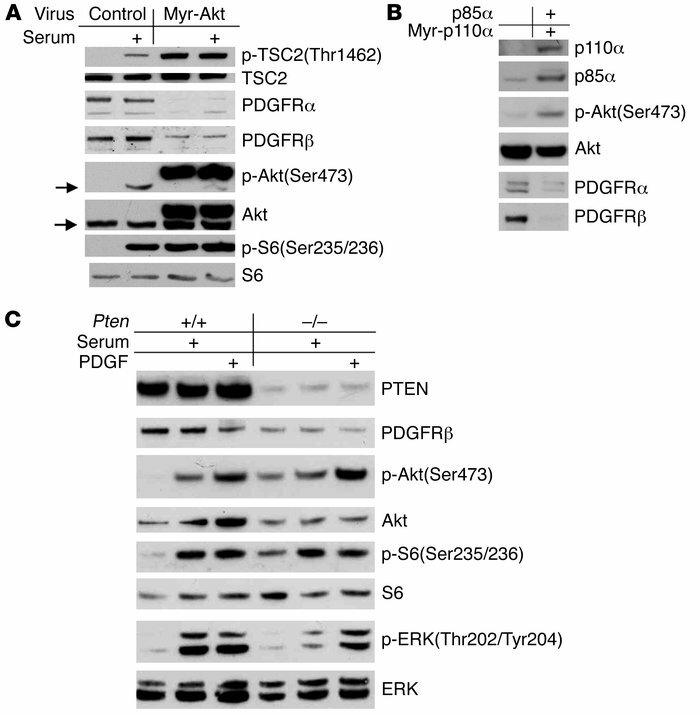 Activation of the PI3K/Akt/mTOR pathway reduces PDGFR expression. Immunoblot analysis is shown for multiple MEF lines. (A and C) MEFs were starved for 2 days and stimulated with either 10% FBS or 50 ng/ml PDGFbb for 10 minutes. (A) MEFs with ectopic myr-Akt have elevated p-TSC2, p-Akt, and p-S6 levels and markedly reduced PDGFRα and PDGFRβ levels in comparison to control cells. Arrows indicate endogenous Akt. (B) WT immortalized MEFs transiently expressing the p85α and myristoylated p110α subunits of PI3K show a marked reduction in levels of expression of both PDGFRα and PDGFRβ. (C) PTEN-null MEFs show increases in expression of p-Akt and p-S6, with a decrease in PDGFRβ expression.